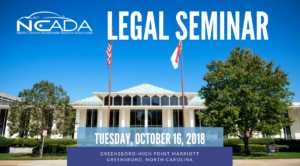 Join us for the Annual Legal Seminar on Tuesday, October 16, 2018, at the Greensboro-High Point Marriott from 10:00 am – 4:00 pm. NCADA’s Legal Team will review hot button legal issues and trends facing North Carolina franchised dealerships. The cost is $205 per attendee. Make plans today to attend this important seminar! New Used Car Buyers Guide – FTC Conducting Enforcement “Sweeps” – Making Sure Your Dealership is Compliant. New Tax on Shop Supply Fees – How to Implement. Multiple Sales Tax Changes for Franchised Dealers in the Past Five Years – Is my dealership charging the correct tax on the correct items? Franchise Law Updates – New Protections for Franchised Dealers in 2018. Please note: If you need overnight accommodations for the evening of October 16, 2018 may be made by calling 1-800-228-9290 or you may book online. NCADA has secured a rate of $329 per room. Please call to reserve your room by Monday, 9/17 to ensure this special rate!